A few weeks after the ouster of Egyptian president Mohamed Morsi in 2013, the New York Times ran this headline: “Egyptian Liberals Embrace the Military, Brooking No Dissent.” The accompanying photograph showed a man with a full beard and shaved moustache in the Salafi style, a prominent prayer mark (a “raisin” in the Egyptian vernacular) on his forehead. Behind the man is a wallpaper of Muslim pilgrims circumambulating the Kaaba in Mecca. A framed portrait of then-general and coup master Abdel Fattah el-Sisi leans against beige tiles stickered with several Qur’anic verses. The headline limits the military’s support base to (secular) liberals, while the image shows us it actually extends beyond this narrow stratum. 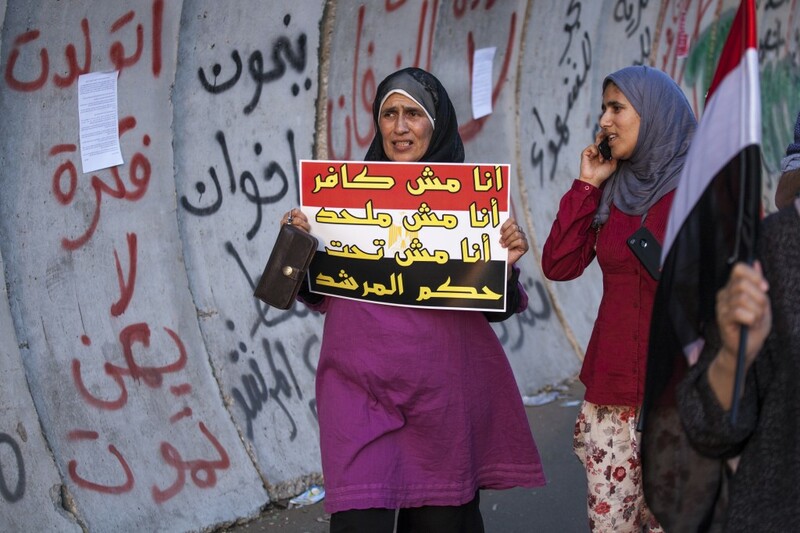 With some exceptions, such as analyses published in this series, most scholarly accounts dovetail with media framings of Egypt’s fraught political scene since the 2011 revolution as primarily a struggle between secularism and Islamism. But the “secularism versus Islamism” narrativ­e is a political one—it performs important legitimizing labor for a plethora of social actors in Egypt, from the Brotherhood­ to deposed dictator Hosni Mubarak’s allies and both liberal and leftist activists alike. It is, however, of very limited analytical utility in making critical sense of what is actually at stake in the current impasse for the many Egyptians who do not subscribe to a secularized conception of government, yet whose religiosity cannot be conflated with the Islamism of the Muslim Brotherhood. These include Egyptians who are active participants in the country’s long-standing Islamic Revival, like the Islamic television producers with whom I conducted fieldwork between 2010 and 2013. These producers worked for a transnational Islamic channel that defined itself primarily against the Salafi television channels that were closed down by the military following the coup. Most producers working for this channel saw themselves not just as muttadayinin (religious) but also as islamiyin (“Islamists”). Yet, they were highly critical of the Muslim Brotherhood’s year in power, with many of them joining the massive June 30 protests against Morsi. My interlocutors in the social world of Islamic media who supported the call for Morsi to step down are not “secular liberal elites” as most accounts would have it. To the contrary: they explicitly believe that secularism cannot be legitimately justified or reasoned from within an Islamic frame. This is because, for them, Islam guides and makes normative claims on every aspect of human life, including political life. They were not against the Muslim Brotherhood because of its similar commitment to the “comprehensiveness” (shumuliyyat) of Islam, but because they perceived the organization as arrogant and incompetent, nepotistic and exclusionary. That the Brotherhood claimed to be acting in the name of religion while behaving badly made its actions much worse, but their support for Sisi’s removal of Morsi in no way hinged on seeing the military as a bastion of secularism. Of course, some of these Islamic media producers were against the coup. But their support for Morsi was highly contingent and not at all predicated on accepting the claim that his party represents Islam. For example, a few weeks before the scheduled June 30 protest, one producer wrote a post on his popular Facebook page in which he expressed his support for Morsi finishing his term, even as he sharply criticized Morsi’s performance thus far as well as those who “sacralize” Islamist parties. He wrote that he was ready to vote out Islamists for being incompetent and elect non-Islamist politicians if they are better able to govern. These sentiments illustrate the fact that some Egyptians do not see the Brotherhood’s Islamism and secularism as the only two options available to them in organized political life. Moreover, they show that these two ideologies do not exist as their proponents would have us believe. Instead of subscribing to an either/or logic, most of the media producers I came to know within the “Islamic trend” evinced an activist sensibility that was largely indifferent to the competing ideological claims—held by either organized Islamist groups or their secular liberal counterparts—of what the “New Egypt” should be. To argue, then, that the widespread condemnation of the Brotherhood indicates a “reversal of Islamization” presumes as descriptive the one prescriptive political claim that unites both secularists and pro-Brotherhood Islamists in Egypt at this moment: that Islamization is synonymous with Brotherhoodization. But for my interlocutors, the Muslim Brotherhood’s narrative—that whoever is against them is actually against Islam—was galling, to say the least. They would passionately contest this narrative using the same rhetorical strategies and authoritative textual resources of the Islamic tradition that Brotherhood supporters use to make their own claims. The extent to which the distinction between the political narratives of our fieldwork interlocutors on the one hand, and our scholarly analysis of such narratives on the other, has been collapsed in serious writing on post-June 30 Egypt is extraordinary. For example, observers describe in too-broad strokes those who opposed Morsi and the Muslim Brotherhood as liberals, secular fundamentalists, and/or elites bent on preserving their class privilege. Others characterize Egyptians who joined the massive June 30 protests against Morsi’s presidency as preferring “secular autocracy” to “Islamic democracy.” These descriptions and claims are also quite widespread in Egypt—they are put forward by pro-Morsi/anti-coup Egyptians. My point is that just as we rightly analyze the military’s claim that its brutal repression of the Muslim Brotherhood is a “war on terror” for the political work it does in rendering state violence against the organization legitimate and acceptable for some Egyptians, we should also analyze the Brotherhood’s claim that this repression is a “war on Islam” for its mobilizing potential. While an analysis of both claims can yield rich insight into the contradictory anxieties and desires of Egyptian political actors at this present juncture, neither claim should become the analytical vantage point if we hope to understand the social lives and complex histories of these anxieties and desires, and their intersections with wider processes and relations of power. As critical thinkers, we obviously make qualitative distinctions in our writing as a matter of course, distinctions which will, at times, be morally evaluative—what one scholar commenting on the Muslim Brotherhood’s strategies might laud as “pragmatic,” another might denounce as “unprincipled.” It is problematic, however, when we conflate the moral evaluations and qualitative distinctions of the social actors we are analyzing with the conceptual edifice we create to describe social reality—that is, when these edifices cease to be recognized as one account of social reality that is contested by others. That the ongoing political struggle in Egypt is one between secularism and Islamism is one such contested account. Yasmin Moll is Assistant Professor of Anthropology at the University of Michigan and Postdoctoral Fellow in the Michigan Society of Fellows. Her research focuses on Islamic televisual media in (counter)revolutionary Egypt.